Belated Christmas & New Years – simply life.food.fitness. Since he doesn’t eat turkey, we had to come up with something fitting for the occasion. 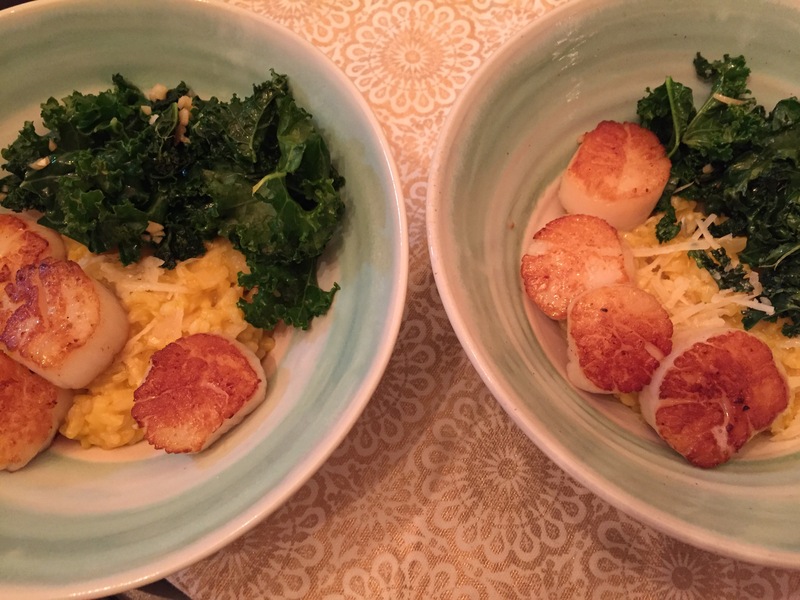 Enter, risotto with scallops! My recipe is modified from this one from SkinnyTaste. Now, I’ve only made risotto once before, and that was really just as an experiment to see if I could make it, and neither of us has made scallops! No pressure or anything. Thankfully, I have a wonderful seafood store that was able to give me tips on how to not botch the poor, beautiful scallops. In a small pot, on low heat, warm the vegetable broth/water. I don’t love the taste of vegetable broth, so I cut the 4 C down to 2 and used water to thin out the flavours. In a frying pan, on medium-low heat, melt the butter. Add the garlic and shallots. Cook for about 1 min to allow the flavours to come through. Add the rice, salt & pepper, and continue to stir. Basically, risotto is just a good shoulder workout – there’s a lot of stirring! Cook for about 2 mins (while stirring), until the rice starts to lighten (turn shiny/translucent). And stirring, until the wine is sucked into the rice. Then, ladle in your stock/water, little bits at a time…and keep on stirring, taking sips of wine as you go. When you have about 2-3 more ladles of liquid left, add the parmesan and start the greens and scallops. In a frying pan, heat the butter and garlic. Add the greens and cook until “done”. In a non-stick or cast iron frying pan (you can use a different pan, but you’ll want to lay down a bit of salt to keep the scallops from sticking), heat the pan over medium heat and add the coconut oil. When the pan is hot (not warm, hot), add the scallops and cook for 4-6 minutes on one side. Flip the scallops and cook another 1-2 minutes. Cooking time depends on how large/thick the scallops are.